So I am watching a 1982 documentary of Fela, the great man, revolutionist through music and his spoken word, traditionalist (by protest and education), lover of people and of many women, disciplinarian, believer in equality. 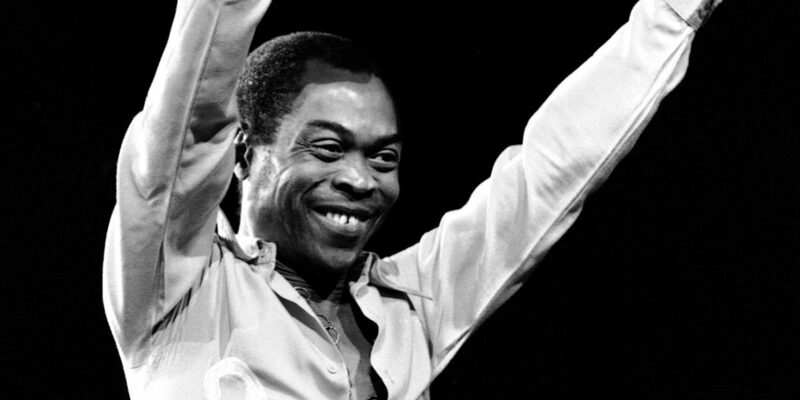 Since I was a child, I have always loved and respected Fela for his influences, and was an ardent follower of his message over the years, daring to go, alone and by public transport, to the spot in Ikeja where his music was sold; but careful not to go to the Shrine, lest I get carried away – I have always been fully aware of my tendencies, weaknesses and extremist nature. Anyway, Fela said in this interview in 1982, that Islam and Christianity are artificial religions and that the reason for the missionaries call to conversion into religion in the form of Christianity and Islam in Nigeria was for the exploitation of the people and to divert the people’s minds from their roots – essentially, all Christians think like the British and Americans and all Muslims think like the Arab. Hmm. I paused and I wondered, thought deeply and asked the Holy Spirit of God for Light. Generally, peoples positions on things, understanding of issues (global or local) and their resultant actions (by daily living or reaction to identified issues) are a cumulative result of their experiences in their life journey. As with the rest of mankind, someone in years to come will have a better understanding, the advantage of foresight/insight/history and a maybe even a deeper understanding/revelation of God than I do now and maybe re-write my stated position below, better; but before then, I will write. Was religion exploited by the initial preachers of the main religions? Very possible, it could have been…but truly, with hindsight, they were merely conduits of the message of God. Exploiting the cause of the Gospel/Islam for religious and political reasons, but handing the message down to peoples of all nations regardless? What was it that Paul the Apostle said? By any means the Word of God is preached? Rightly or wrongly, the message of God has been handed down; the messengers were simply tools in God’s divine plan to impact His Truth on His people all over the world. So, was Fela right then? Yes, only in respect of the pulse of Nigeria as he knew it during his existence; but I find that time (and this fleeting life) often leaves people short sighted and unable to accurately identify the essence of one thing in a particular season and project its wholesome truth into the next. So, my people were indeed, exploited and the first step towards such exploitation could have been religion. But what does that mean then? Do the Nigerian people in 2009, think like Europeans, Americans and Arabians by reason of their religion/spiritual inclination? Let me speak for the Christians alone as I am more familiar with our development over the last 25 years of my awareness of religion in Nigeria. I think Nigerians have developed their own understanding of the Word of God, based on their collective economic suffering and stifling as a people by the Government (Military and Democratic alike). Nigerians, have also interpreted the Word against their traditional understanding of spiritual applications, set against their deep and desperate needs. We are a people deprived – of education, of exposure, of basic infrastructure, of healthcare, of knowledge, of vision. This is the basis from which Christianity has been defined by the average Nigerian Christian with the slightest Pentecostal leaning. Other Christians (regardless of denomination) who have undertaken to study the Bible (with all of the biases, judgments and truths of the writers of the same) are fully aware that ours is not the religion of the European or American; indeed, the discerning Christian can only be likened to a reformed Jew. Not British, Not American, only Jewish, where such a Jew has accepted of the message of Christ. I do not believe that the discerning Nigerian Christian, believes anymore that Peter, Paul and John and James are English names as against Jewish names (an adaptation of pronunciation regardless), or that the testaments as presented have resolved purely because of the political machinations of the English or the sovereignty of the White Race over the Black race – especially when really the Israelites do not appear to be either white or black! I also do not think that Nigeria has forgotten its roots, indeed, it seems on a large scale that those roots have been mixed with our Faith (like a herbal potion) and we now have a religion akin to the Jewish customs under the Old Testament with a touch of Christ for saving grace. We are not (or at least no longer) a people deceived into faith, but our experiences have led us to delve into the truth of God’s Word and to create for ourselves, an expression of Christ, as we know Him – at this time alone and in this period of our lives. So, do Nigerians think in European, American or Arabian terms? Of course! But I do not believe that it is only as a result of religion anymore, at least, religion seems not be the focus any longer. It appears instead to be as a result of Nigerians believing that everything imported is superior to anything already existing in the Country. It could be called classism, or greed, or vanity, or even covetousness; but it could also be looked upon (from an angle of love and understanding) as a National desire for a better standard of life or an acknowledgement of better researched technology. Nigerians see things imported and can immediately recognise that they are mostly (though not always) actually and truly better, nicer, durable etc; in the same vein living abroad could be seen as a desperate need for better living conditions, infrastructure…who wouldn’t want stable electricity for crying out loud! I mean, look at it – people would often quickly embrace racism, the acceptance of homosexuality as normal, insecurity of their children in many foreign classrooms from serial murderers and twisted minded students (bear in mind these children were probably given by God after many years of marriage and turmoil and doctors and family wars and testimonies and seed sowing – should I go on?? ), more affordable food and clothes, for the sake of foreign exchange, infrastructure and the sanity of a Government over, the traditions, corruption, insecurity on the roads and in homes, demands for tithes, for offerings, for houses, for goats, ritual killings, the ready and prevalent acceptance of infidelity (male and female) and in some parts paedophilia, corrupt government, corrupt citizens – everything which stares at us daily in this beautiful fertile (in both the human and resource elements) nation full of smiling people. My people understand many things in the Word of God and while Fela, in his season may have understood the problems with and mind sets of the preachers of the “imported religion”, I am not sure that he was visionary enough to see the reach, the depth and the potential of the imported faith. Indeed, God is permeating the Nigerian fabric in a variety of ways and degrees at a time, and soon the myopic understanding of His truth, the application of His Word for only material things, the desperate and selfish need to be better than the next man, the desire to be exposed, the education of our children to be classist, the selfishness, the robbery – on the highways and at the pulpits, of people’s dreams, time and resources, the imposition of traditions (which are not essential to Faith), will soon pass away and in the future I sense that gradually, the Truth of the Father’s Sovereignty and His Love will be established. And as with the preachers of old and temporal colonialism (for it only lasted everywhere for a season –painful; but it ended one day), He will use everything as His tool – economic hardship, re-structure, provision of infrastructure, poverty alleviation, travel and exposure, performing government, angry citizens, thinking men women and children, individual (but dispersed) unquenchable desires for something better, wisdom, growth, sickness, marriages, divorces, street carnivals, television, radio, technology – everything good and seemingly bad, to slowly cause the immateriality (of materialism) to fall away and put in place His Truth. But as with everything that wisdom directs, the bad will grow with the good for a while. I have seen everywhere, people who have discarded Faith by way of protest, and as brilliant as their works have been, the application of human strength and wisdom (even when divinely inspired) seems too often to result in the deviation from God’s Truth. I see men who have held the forte in Nigeria in various areas of injustice, unable to provide balance between Truth, morality and societal justice. I see my love and dearly respected icon, Fela and with him I see 28 women, Indian hemp, spirituality of an uncertain form and AIDS – indeed, I also see the fact that his music is and has been produced abroad – the very import essentiality that he fought against in form of religion, he embraced in form of quality; then I see Tai Solarin, respectable disciplinarian and human rights activist and with I him I see no God – in any form; I see Awo, a nationalist and I see with him politics, better than was available at the time, but faulted now against better understanding and knowledge. I pray for the next generation – I look forward to the men and women who will fight for us and with them I pray to see the balanced Word and Truth of God, a testament to eternity and hope to mankind.